"We decided to do a stock offering as a way to restructure the debt," Doyle said. The theater plans to offer 480,000 shares of stock in the theater at $1 a share (purchasable in lots of 100 shares) by Jan. 1. The idea has a proven populist punch; a similar "crowdfunding" approach was used to produce the 2009 film "The Age of Stupid," a well-received feature film with an environmentalist message. It'd be the plotline of an engaging Hollywood movie, but it's happening in real life in Seattle, and you, dear moviegoer, get to help write the happy ending. In the six years since it opened in south Seattle, the Columbia City Cinema, the independent movie theater at 4816 Rainier Ave. S., … has come to endear itself to moviegoers weary of trekking downtown for movies. The theater regularly screens first-run films, sometimes films opening the same day at the bigger multiplexes downtown. 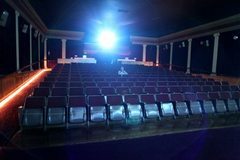 The cinema, which opened upstairs in the building in 2004, has been facing the same economic challenges in recent years as its loyal patrons. "We have been playing catch-up and improvising from the beginning," said owner Paul Doyle. "It's been like the endgame in chess." Doyle said the troubles began in 2007, "when our downstairs tenant defaulted on the rent. When we got rid of him, we were paying double rent because we had a vacant downstairs.